This unique 2D night light will light up your loved ones’ memory every time they glance at it. You just have to upload your favorite photograph and you are good to go. We would recommend you uploading a photograph of up to 2 people that will be laser etched in your 2D night light crystal. A gift they will always remember. Capture your favorite moments with the laser etched 2D night light. 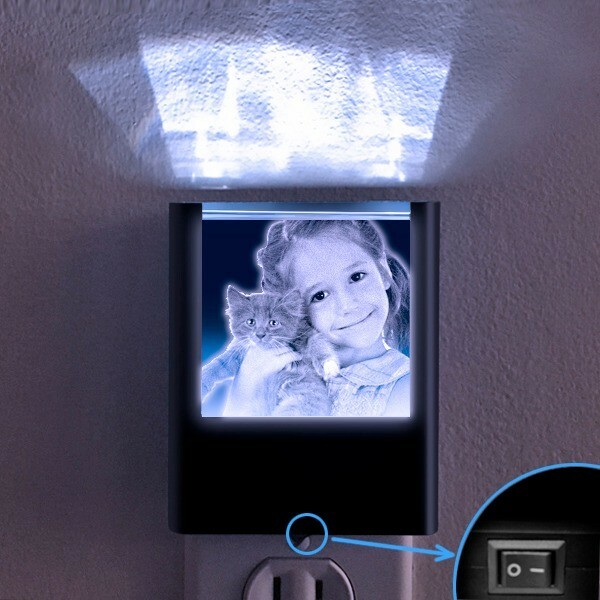 This is a custom photo night light that will be always remembered by your loved ones. It is the best gift for birthdays, anniversaries, and weddings. What’s more is that you will never have to worry about the bulb as the LED lights last for over a decade. We support Jpeg, Jpg, Png, Bmp & Tiff files. It is best to avoid blurry or dark photos. In the rare circumstances, if we cannot use your photo for your crystal; we will contact you for a different photo. Please note if you see your image in the preview window, your image was uploaded successfully and we will be receiving the original image you uploaded.